Isn't love a very elusive emotion to possess at times? It doesn't have that stability you really desire, because it constantly slides back and forth like a snake with a rather nasty itch to scratch. What's that you say? No? Oh! It must be just me then. Me and the Director: Sidney Gilliat; with the Actors: Peter Sellers, Mai Zetterling, Virginia Maskell, Richard Attenborough, and Kenneth Griffith. Especially in 1964, and for about 106 minutes. On the surface, sexually frustrated Welsh librarian -- John Lewis (Peter Sellers) -- has a somewhat quaint and normal existence. He has a hardworking wife -- named Jean (Virginia Maskell). He has three children -- two real; one fictitious. He lives in a house situated somewhere in the valleys -- to his chagrin. Plus he has a very good chance of furthering his own career, if he has an affair with the glamorous young gal called Liz (Mai Zetterling). Oh! Wait a minute! You don't know who Liz is, right? Well, not only is she the wife of the wealthy socialite -- Vernon (Raymond Huntley) -- who's in charge of John's place of work. But she's also the lady of leisure that's aiding John's old arch-rival -- Probert (Richard Attenborough) -- in producing a play he's written. So what do think John should do, huh? Stay at home with his wife and kids? Or should he do what his libido wants him to do; and jump into the sack with Liz? Yes. I'm afraid to say it's 'jumping time', dear reader. Which commences when he goes to a party she's throwing at her house one enchanted evening, and then continues not so long thereafter at a theatre at night. Still, that's most probably why what next transpires all goes to pot when John's pal, Jenkins (Kenneth Griffith), fells a bit sick. As plays crash and burn - affairs take a left turn - interviewers speak in code - and life eventually begins when a librarian decides to hit the road. 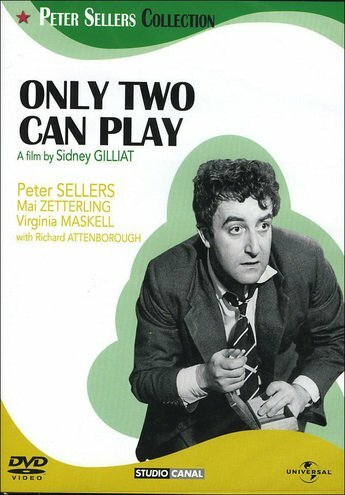 Now I was first led to watch 'Only Two Can Play' when I saw an exert of it quite some time ago in a Peter Sellers documentary I watched. And do you know what? It's a good job I did. This ballsy comedy is a smashing film. Having that quaint yet bold gravitas that certain movies of this era brought along with it. Furthermore, the acting's on point, the story is emotive, and the over premise is very translatable to any day and age. You see, in essence, this adventure is about a man who wants to escape from his everyday life, by having an affair with someone he is very attracted to. Admittedly, this seems like a fairly normal conceit for any film, doesn't it? Plus something every Joe-Blow can connect to on an emotional level. However, what this flick does -- compared to some other flicks I care not to mention -- is make you sympathise with the main character's situation. Normally I would be shouting at the screen and saying 'Oi! Cut that out you dirty sod! You've got a wife and kids indoors!'. But for some unknown reason, Peter Seller's character charmed the pants off me. And I began to understand why he wanted to shag the blond bint instead of living the 'colloquial life'. Come on. Let's face facts. Haven't we all pondered if the grass was greener on the other side? Haven't we all been somewhat intrigued about playing away from home? It's something I've reluctantly contemplated upon from time to time. Not playing upon this instinct. Of course. But still worth a thought on occasion. Anyway, before I go all 'hormonal' on you, let's have some filmic-facts now, shall we? (1) 'British Lion Film Corporation' released this picture in England on the 20th of March, 1962. (2) This film was based on a 1955 Kingsley Amis novel originally entitled, 'That Uncertain Feeling'. Moreover, in 1985, the BBC adapted this book into a television series starring Dennis Lawson and Sheila Gish, giving it back its' initial title. (3) I kid you not; Aberdarcy, the South Welsh village where this film is supposed to be set, isn't real. (4) Certain parts of this production were shot in around Swansea, Wales. For example: The exterior of the Library was in actual fact the outside of 'Glynn Vivian Art Gallery'. The Tennis Courts were located opposite 'Bishop Gore School', on De La Beche Road, Sketty. Plus the numerous street scenes were shot throughout the district of Mayhill. (5) In 1962 this comedy was ranked as the third most successful film at the British box office. 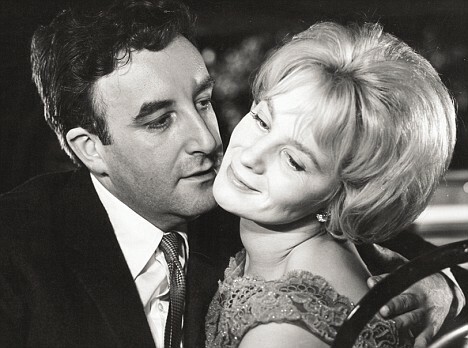 (6) Not only did the scriptwriter for this film, Bryan Forbes, direct Peter Sellers in the all-star comedy, 'The Wrong Box', but in real life Peter was once in love with Bryan's wife, Nanette Newman. (7) A year before she tragically passed away from cancer, Swedish starlet, Mai Zetterling, starred in the 1993 Swedish movie, 'Morfars Resa', with the 'Seventh Seal' superstar, Max Von Sydow. On a side note, the director of this film, Sidney Gilliat, passed away on the same year Mai did. (8) Well my giddy Aunt! Didn't the chap who played 'Salter' in this yarn, John Le Mesurier, appear in a lot of Peter Sellers films? Such as: 'The Magic Christian', 'The Pink Panther', 'Casino Royale', 'The Wrong Box', 'The Wrong Arm of the Law', 'Waltz of the Toreadors', 'Never Let Go', 'I'm Alright Jack', plus Peters last one, 'The Fiendish Plot of Dr. Fu Manchu'. Overall, 'Only Two Can Play' is great film. And is one to watch if you want to have a bit of a chuckle at someone who finally gets there in the end. Try to think of it as a timely soap opera with a lot of personality, a tighter plot-line, and a message that is relevant in any day and age. Class in a can. Say no more.